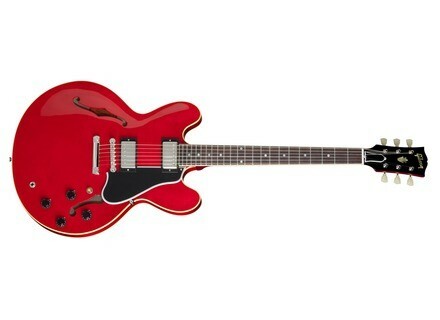 The Gibson Custom Shop celebrates 20 years of classic guitar reissues with new reissues, including the ES-335. For this 20th Anniversary, the Gibson Custom Shop launches two reissues of the ES-335 semi-hollow guitar, the 1959 version with Dot inlays and the 1963 edition with Block inlays. Gibson USA honors Les Paul with a Tribute guitar 2013 is The Year of Les Paul at Gibson, and the brand honors the man with a limited edition Les Paul Tribute guitar. New Gibson Les Paul Joe Bonamassa Signature Joe Bonamassa signs at Gibson a new limited edition Les Paul Standard guitar with Gold top. [NAMM] Gibson launches the Jason Hook M-4 Sherman Gibson USA announces the availability of the M-4 Sherman Jason Hook custom Explorer, limited to 400 guitars worldwide.